Preheat oven to 180°C/350°F. Score a diamond pattern across skin of ham. Peel carrots and then cut lengthwise into quarters. Add juniper berries, coriander seeds, cloves, peppercorns, mustard, water, white wine, sugar, and salt to a small saucepan and cook over medium heat for approx. 5 – 10 min. Roughly chop parsley. Line bottom of baking dish with carrots. 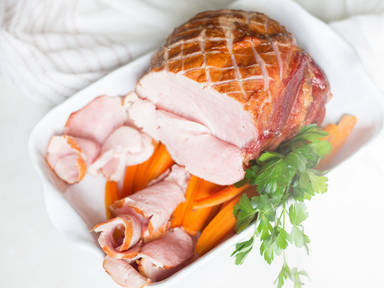 Place ham on top, baste with glaze, and bake in preheated oven at 180°C/350°F for approx. 30 – 35 min. Remove from oven, carve, and garnish with roasted carrots and parsley. Baste with remaining glaze and season with salt and pepper. Enjoy!